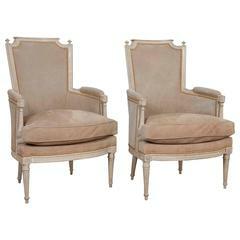 Elegant set of 6 Louis XVI style Parisian dining chairs with peach-colored velvet high quality upholstery. Stylish and comfortable, from a Parisian apartment, possibly Jansen. 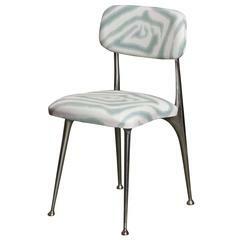 A beautifully upholstered set of mid-20th century, polished-aluminum, dining chairs by Shelby Williams. 6 upholstered in fabric shown. 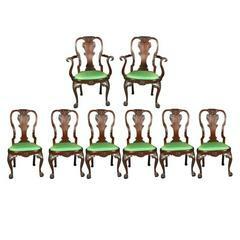 A late 18th-early 19th century pair of Swedish bergere form painted chairs now smoothed and waxed.